Rosette Orbital showing a body attracted by a force proportional to 1/r. The simulation begins with a body (or satellite, shown as a red ball) with a certain velocity that is tangential to an point attractor (shown as a yellow ball in the centre) whose force diminishes with distance (i.e. 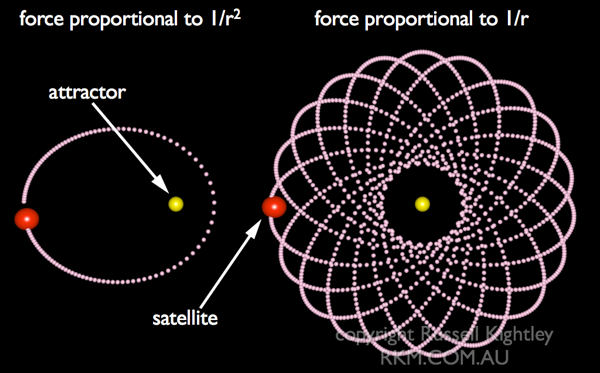 is inversely proportional to r. The resulting orbit creates a flower-like pattern or rosette. Notice how the object speeds up as it approaches the attractor. This is shown by the tracer balls being more widely spaced. Once the movie has fully appeared you can move the slider back and forth to see these effects at different speeds. At right, the graphic contrasts orbits around an attractor whose force is proportional to 1/r2 to the rosette orbit (at right) where the force is proportional to 1/r.